*Warning*- This Creatine Contains Nitric Oxide. The main ingredients are nitric oxide, caffeine and creatine. The nitric oxide widens the blood vessels which acelerates blood flow to the muscles. If you have problems with nitric oxide or heart problems, please consult a doctor before you try this product. 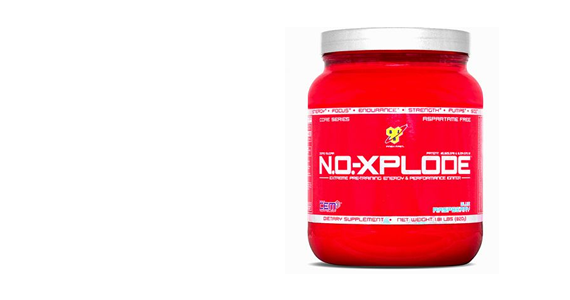 “N.O.-XPLODE™ is BSN’s #1-selling extreme pre-training energy and performance igniter. Before athletes step into the gym, on the court or in the ring, they will experience elevated energy and motivation, increased blood flow and oxygen uptake, unparalleled strength and stamina, and tunnel-vision-like mental focus, allowing athletes to channel their efforts in order to dominate the task at hand. Amazon has it new for about $38 and bodybuilding.com has it for about $40. They are both around the same price so it doesn’t really matter where you get it from although shipping might be cheaper with Amazon. If you can afford it, No xplode is definitely the best creatine supplement around. Compared to other creatine supplements, it just blows them out the water. When on this stuff, you are focused and hyped up to lift some weights. This product makes you feel like you can jump off a building and not get hurt. Definitely give this product a try if you need a powerful creatine market to jump start your routine. If you have the money, definitely give No-xplode a try. If you have tried No-xplode , please rate it below. For more consumer reviews, visit our homepage.